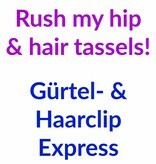 Home Rush my hip & hair tassels! Delivery time: USA: 6-10 work days CA: 7-12 work days AU & NZ: 8-13 work days UK: 4-6 work days Europe: 5-6 work days JP: 6-8 work days Dates only apply if you pay promptly with your order and use an instant payment method like Paypal or Visa/ Mastercard. 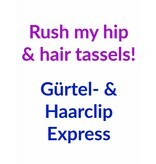 Rush my hip & hair tassels - the affordable way to get your belly dance, larp, or cosplay costume tassels quicker! You can always add a hip and hair scarves to this tassel express order, because hip and hair scarves are the only items we have in stock anyway! This express option is not available all year round, but only when our order situation admits it. We must deactivate it before Christmas, because shipping times vary strongly then, so we are not able to calculate exact delivery times. We make all hip and hair tassels to order and include 3-4 business days in our delivery time for this process. Adding this upgrade to your yarn tassels order, will reduce the delivery time for your country by 3-4 business days, because we will make and ship your tassels still the same day (for very early orders only) or it's the first order we make the business day after your order! Your order and payment must reach us before 17:00 CET (= Central European Time, we are in Cologne, Germany) to qualify for next day shipping. If we receive your order and payment before 9:00 CET, we might even be able to make and ship it the same day. You can check our time by asking google for CET or local time in Germany. The upgrade is valid for 1-2 tassels ( a pair or different models) and as many hip and hair scarves as you wish to add (those we have ready to ship). If you want 3 or 4 hip and hair tassel clips, you must buy the upgrade 2 times. The upgrade applies to all hip and hair tassel clips and includes the ones with peacock feathers and leaves. Don't buy this upgrade without a hip and hair tassel clip, this does not make any sense :)! If you wish to order more items than tassels, please place two orders, because we must ship your hip & hair tassels seperately (only hip and hair scarves are an exception, because we have them ready to ship). However there is an express listing for a dread fall and 1 or 2 tassels, because these items are often combined! Dates only apply if you pay promptly with your order and use an instant payment method like Paypal or Visa/ Mastercard. This rush-my-order-offer is especially interesting for international customers outside Germany, because it's the cheapest way for you to get your order quicker. International shipping upgrades are really expensive (for the United States they start at $ 80 for example, exact fee is determined by exact weight of the parcel), so it's more economical for you if we work a night shift extra to make your dream dreads super quickly!